The trend of homegrown hops continues to vine its way through local communities. Last week, the North Carolina State University Mountain Horticultural Crops Research and Extension Center in Mills River held a workshop entitled “Growing Hops in Western N.C.” to talk about the commercial viability of growing hops in the local economy. The Local Beer Blog cataloged the efforts of North Carolina’s workshop, which hosted more than 90 people, including those who came all the way from Virginia, South Carolina and Tennessee. The North Carolina Mountain Horticultural Crops Research & Extension Center held a workshop entitled “Growing Hops in Western N.C.,” which hosted more than 90 people, including those who came all the way from Virginia, South Carolina and Tennessee. • Hops must have healthy soil with lots of Nitrogen, Phosphorous and Potassium. This means most farmers will have to use a significant amount of fertilizer. • Hops need good air-circulation to help avoid infections from downy mildew and powdery mildew. • Hops like to grow towards the sky — and fast. Hops growers must build a 12 to 20-ft tall trellis for the hops to grow on, a task which presents its own challenges. 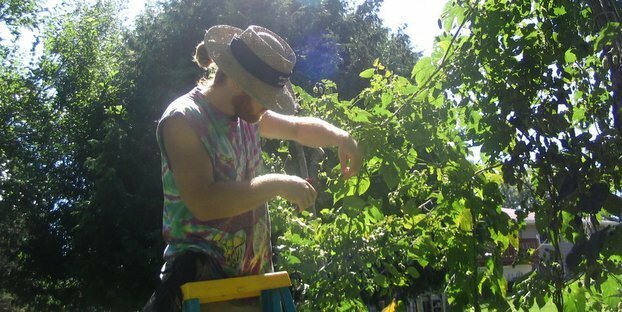 • In North Carolina, certain hops varieties grow better than others. • Pests like spider mites, Japanese beetles and viruses can cause serious damage to your hops plants. To make matters more complicated, Greg Lewis, a hops expert who has worked all over the hops industry, including a stint with Hop Union, explained the difficulties in growing hops to the “Growing Hops in Western N.C.” crowd. First of all, hops are a “short-day” crop. They grow best at certain latitudes where the longer days of the summer start to get shorter, triggering the female hop plant to start producing flowers (these flowers are the hops that brewers ultimately use to make beer.) Hops grow best between the latitudes of 35 and 55 degrees, which puts the major hops growing regions, such as Germany and Washington state, right in the middle of that range. And where’s North Carolina? Right on the 35th parallel. Because we’re closer to the equator, the days don’t change as much as they do further north, so some varieties just don’t perform very well. Further, fitting the growing season between the frosts restricts growers to just a few hops varieties. As a result, breeding new, North Carolina-specific varieties could play an important role in making a local hops industry feasible. But just as the malt industry is cultivating local varieties, hops growers are seeded across the state, namely Blue Ridge Hops, Echoview Farm and Holmes Brothers Hops. Clearly a well-attended hop growing event is good news for folks in North Carolina and the craft beer industry across the country. With new interest comes new opportunity and solutions to age old problems. Innovation is growing in local communities that seek to support the beer they proudly brew. For the full, in-depth N.C. hops feature, check out the Local Beer Blog.